Fixed Income Credit: The credit product; Government bonds and credit; Benchmarks for credit; Corporate bonds; Floating rate notes; Credit related instruments; Asset backed securities; International bonds; Commercial paper; High yield bonds; Credit risk; Risk management of fixed income portfolios; Credit Metrics; Credit Indices; Optimisers; KMV model; Rating agencies; The Loan Portfolio: What is loan portfolio management? ; The loan market; Definitions; Relative value analysis; Term sheet of a loan; The syndication process; Pricing within a commercial bank; Loan ratings; Risk management; Approaches to management; Economic vs. regulatory capital; CaR; Loan case studies; Concentration management; Hedging techniques; Central themes; Credit Derivatives Introduction; Why use credit derivatives? ; Definition of a credit event; Credit default swap; Total Return swap; Securitisation overview; Dynamic credit swaps; Credit options; Credit linked note; First to default; The default swap basis; Pricing; Source of pricing; Pricing Examples; Regulatory environment; Terminology; Securitisation: Asset backed securities; Mortgage backed securities; Auto and loan back securities; Collateral analysis; Analysis of securities; The importance of credit derivatives; CDOs; CDO asset types; Credit enhanncement; Detailed evaluation of asset backing and enhancement; Investor analysis; The Credit Risk of Interest Rate Products: Introduction; Exposures; FRN analysis; Swap; The Fundamentals of Credit: The standalone loan; Standard measures; A portfolio as a set of standalones; Introducing correlation; Other approaches to default; Copulas; Moody's diversity score; KMV's risk calculation. 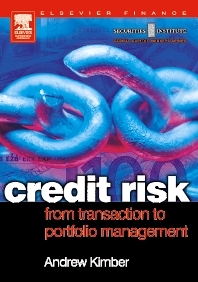 Credit Risk: from transaction to portfolio management provides high level, focused analysis of the nature of credit risk in investment bank portfolio management. Written by experienced international practitioners, it offers in-depth information and advice that will help all those charged with managing credit risk at the sharp end. Credit Risk provides financial institutions and their staff with everything they need to know about how to control and manage credit risk. It gives sound analysis of trading strategies and complex derivative product, offers an understanding of settlement procedures and legal issues, and shows how to accurately quantify and measure related risks.